CRS-14 was launched atop a SpaceX Falcon 9 rocket on April 2, 2018. After a two-day trek to the outpost, Dragon positioned itself about 10 meters below the U.S. Destiny laboratory module. Then, using the robotic Canadarm2, the spacecraft was “captured” by Expedition 55 astronaut Norishige Kanai of the Japan Aerospace Exploration Agency. Over the next several hours it was moved to the Earth-facing port of the Harmony module where it was attached and remained for just over 30 days. During that time, the six-person crew gradually emptied the capsule of its 2,647 kilograms of experiments, supplies and consumables, before filling it with some 1,800 kilograms of equipment for an Earth return. At 9:23 a.m. EDT (13:23 GMT)—just minutes after NASA’s InSight lander was placed on a trajectory toward Mars from a mission launch from the West Coast—Dragon was released. At that time, the capsule and ISS were flying about 410 kilometers just south of Australia, according to NASA. Over roughly 12 minutes, the spacecraft performed three departure burns to move Dragon safely away from the outpost’s 200-meter keep-out sphere. After that, it safely coasted away from the $100-billion, 400-metric-ton complex for about 5 hours. Protected by a heat shield made of PICA-X, a variant of NASA’s Phenolic-Impregnated Carbon Ablator, the spacecraft survived temperatures that reached some 1,600 degrees Celsius as it made its way through the atmosphere. Once it slowed down enough a series of parachutes deployed culminating in the release of three 35-meter diameter main parachutes to slow the vehicle down to just 115-25 kph. Splashdown took place some 640 kilometers southwest of Los Angeles. 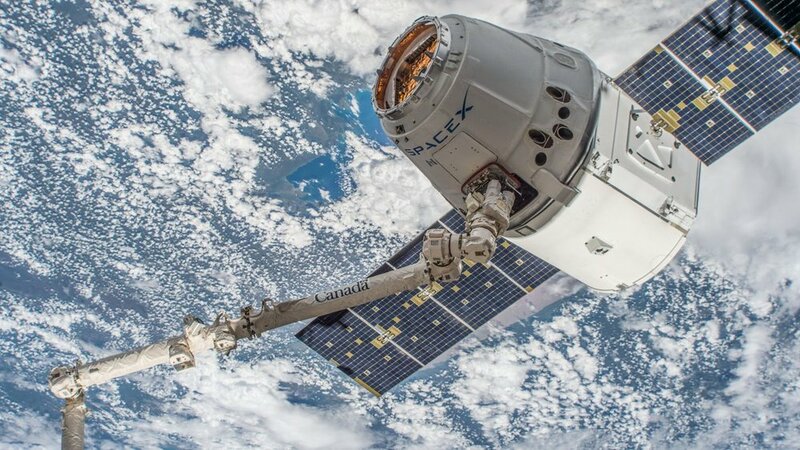 The remaining cargo will be removed and transferred to the NASA once Dragon is transported to the company’s rocket test facility in McGregor, Texas.